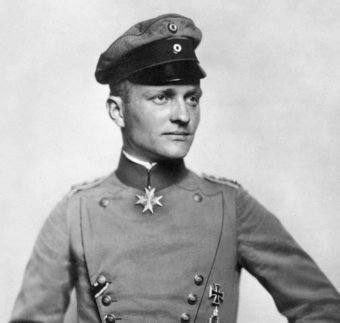 It was a century ago when famed World War I German fighter pilot Manfred von Richthofen was fatally shot out of the sky. Yet, his nickname – “Red Baron” – remains part of American vernacular. Charles Schulz’s comic strip character Snoopy famously took on the Red Baron in his imaginary air battles aboard his doghouse, often yelling “Curse you, Red Baron!” Movies and songs feature the German war hero. Even a Minnesota-based food company co-opted his name and image to sell frozen pizza. So, who was the Red Baron? And why do we celebrate him, even though he was an enemy of the Allied Forces who, beyond some number of unconfirmed kills, shot down a confirmed 80 Allied planes during World War I? I found it difficult to bear the strict discipline and to keep order. I did not care very much for the instruction I received. I never was good at learning things. I did just enough work to pass. In my opinion it would have been wrong to do more than was just sufficient, so I worked as little as possible. The consequence was that my teachers did not think overmuch of me. On the other hand, I was very fond of sport, particularly I liked gymnastics, football, etc. I could do all possible tricks on the horizontal bar. So I received various prizes from the Commandant. Beyond this, he also was apparently fond of pulling “risky tricks” like risking life and limb by climbing the town’s famous steeple. As you might imagine, Richthofen soon separated himself as fearless and bold, a reputation he’d maintain for the rest of his life. Shortly before his 18th birthday, he was commissioned as an officer in a German cavalry unit. On June 28, 1914, a Bosnian-born Slav nationalist named Gavrilo Princip, protesting the integration of his country into the Austro-Hungarian Empire, assassinated the heir to the throne, Archduke Franz Ferdinand. Contrary to popular belief, nobody really cared much about the actual assassination (not even the Emperor himself who wasn’t shy about his opinion that it was a good thing that this particular heir had been killed), but it was a great excuse to wage a quick land-grab war, and as a result the world got one of the most deadly conflicts in history. As a 22 years old cavalryman, Richthofen was sent off to both the eastern and western fronts where he served mostly as a messenger. It soon became clear that, in this age of trench warfare and advanced weaponry, cavalrymen were no longer terribly useful and provided an easy target for the enemy. So, Richthofen got off the horse and was mostly used to find telephone operators and to help the army with supply transfers. Whatever he actually said, Richthofen’s request was granted. After a stint as an observer on flights, Richthofen was promoted to pilot. However, his first solo flight didn’t go well. In a great life lesson for all of us, this man whose name would soon become synonymous with “Flying Ace” crashed. I started the machine. The aeroplane went at the prescribed speed and I could not help noticing that I was actually flying. After all I did not feel timorous but rather elated. I did not care for anything. I should not have been frightened no matter what happened. With contempt of death I made a large curve to the left…Now came the most difficult thing, the landing. I remembered exactly what movements I had to make. I acted mechanically and the machine moved quite differently from what I had expected. I lost my balance, made some wrong movements, stood on my head and I succeeded in converting my aeroplane into a battered school ‘bus. I was very sad… and had to suffer from other people’s jokes. Flying went much better for him after that. Like when he was younger, Richthofen earned a reputation for pulling risky maneuvers – like flying into a thunderstorm against the orders of his commanders. His boldness again caught the attention of his superiors. In 1916, Germany’s top flying ace at the time, Oswald Boelcke, handpicked Richthofen for the new air fighter squadron he was putting together- Jasta 2. From then on, his confidence and reputation only grew. Upon the death of his mentor Boelcke (due to an accidental mid-air collision with a fellow German plane), Richthofen took on the mantle of Germany’s top flying ace. My opponent fell, shot through the head, 150 feet behind our line. His machine gun was dug out of the ground, and it ornaments the entrance of my dwelling. I felt some human pity for my opponent and had resolved not to cause him to fall down but merely to compel him to land. I did so particularly because I had the impression that my opponent was wounded, for he did not fire a single shot. When I had got down to an altitude of about 1,500 feet engine trouble compelled me to land without making any curves. The result was very comical. My enemy with his burning machine landed smoothly, while I, his victor, came down next to him in the barbed wire of our trenches and my machine overturned. The two Englishmen, who were not a little surprised at my collapse, greeted me like sportsmen. As mentioned before, they had not fired a shot, and they could not understand why I had landed so clumsily. They were the first two Englishmen whom I had brought down alive. Consequently, it gave me particular pleasure to talk to them. I asked them whether they had previously seen my machine in the air, and one of them replied, “Oh, yes. I know your machine very well. We call it ‘Le Petit Rouge’ (“The Little Red”). April 1917 became known to the Allied forces as a “Bloody April” largely due to the Red Baron’s elite squadron achieving an astounding 89 victories, accounting for a full one third of the Royal Flying Corps’ losses that month. It’s also noteworthy that the “Red Baron” was responsible for 21 of those confirmed kills in that single month alone. In the summer of 1917, Richthofen reached the height of his celebrity as the squadron leader of an elite unit that all had their planes brightly painted. Because of this, the group earned the nickname- the “Flying Circus.” He became a powerful symbol for the Germans, held up as a fitting example of a perfect soldier. Unfortunately for him, in July of that year Richthofen was severely injured when a slug grazed his head and caused a fractured skull. He was able to land his plane in friendly territory, but it was feared that he was close to death and the injury soon required multiple surgeries. Three weeks later, though, he returned to flying against his doctors’ orders, but this time in an advanced Fokker Dr.1 triplane, the aircraft that is most often associated with the “Red Baron” despite the fact that he only made the last few of his kills in this plane. When I lie like this I have plenty to think about… Now the battle that is taking place on all fronts has become really serious; nothing remains of the “fresh, jolly war” as they used to call our activities at the outset. Now we must face up to a most desperate situation so that the enemy will not break into our land. Thus I have an uneasy feeling that the public has been exposed to another Richthofen, not the real me. Whenever I read the book I smile at its brashness. I no longer have that brash feeling. Not that I am afraid, though death may be right on my neck and I often think about it. Higher authority has suggested that I should quit flying before it catches up with me. But I should despise myself if, now that I am famous and heavily decorated, I consented to live on as a pensioner of my honor, preserving my precious life for the nation while every poor fellow in the trenches, who is doing his duty no less than I am doing mine, has to stick it out. I feel terrible after every air battle, probably an after-effect of my head wound. When I again set foot on the ground I withdraw to my quarters and don’t want to see anybody or hear anything. I think of the war as it really is, not “with a hurrah and a roar” as the people at home imagine it; it is much more serious, bitter. A hundred years later, there’s still no firm conclusion on how the “Red Baron” was actually killed. In the morning of April 21st, the “Flying Circus” engaged a group of Allied fighter planes flying low over northern France. The altitude in question was significant here as it was sufficiently close to the ground for Australian and Canadian machine gunners below to join in the fray. From this, it is curious that Richthofen chose to engage in such a battle in which he’d be taking fire from not just the planes but many enemies below; he is known to have advocated against such generally unnecessary risk to his subordinates. Some have speculated from this that he simply didn’t realize at first he was behind enemy lines, and thus perhaps didn’t know the soldiers on the ground would be shooting at him. Whatever the case, the decision to engage cost him his life. During the battle, Richthofen was hit in the torso, ultimately causing damage to his lungs and heart. As to who fired this shot, to this day the Royal Air Force (RAF) gives official credit to Canadian Captain Arthur Roy Brown for killing the Red Baron. However, it’s noteworthy that Captain Brown was flying above and slightly to the left behind Richthofen when he supposedly fired the fatal shot, yet the bullet that pierced his body came in through the right armpit and exited through the upper left part of his chest. It’s speculated from this that the shot must actually have come from one of the machine gunners below. As you might imagine, many people were keen to take credit for finally bringing down arguably the greatest flying ace of either side in WWI, so determining who actually fired the shot is an effort in futility today given all the conflicting accounts. Whoever killed him, the 25 year old Red Baron did manage to land in a beet field in Somme Valley where he died moments later. What was perhaps most amazing was that, while the Red Baron was an enemy, he was treated as a hero by the Allied forces. Since he had come down in Allied territory, it was on the British and Australians to bury him. And they did so, with his funeral being attended by hundreds of soldiers looking to pay their respects to the man who had killed so many of their fellow brothers-in-arms. 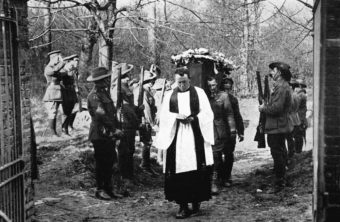 In the end, Richthofen was buried in northern France’ with full military honors, which included a guard of honor and six Royal Flying Corps as pallbearers. Soldiers from the various Allied Squadrons in the area also made wreaths to lay on his grave, including one which had the words “To Our Gallant and Worthy Foe” written on it. At the same time General Sir John Monash sent for the mayor of Villers-Bocage, in which the Australian Corps headquarters happened to be located, and told him that he was disgusted with what they had done and that if such a thing occurred again he would consider removing his headquarters therefrom. This had the desired effect. Beyond honoring a man they considered a worthy advisory, there was also a propaganda element to be considered here; it was an opportunity to show the Germans that their enemies were chivalrous and not the blood thirsty savages that so many propaganda campaigns (on both sides of the conflict) were spreading about their respective enemies. Indeed, photographs of the body and funeral were soon after dropped over German-held positions to both prove Richthofen was indeed dead and to show the respect the Allies had shown him. Ultimately, however, the French would have the Baron’s body moved and later, in 1925, Richthofen’s brother would collect the body and bring it back to Germany. The Red Baron’s remains currently reside in a tomb in Wiesbaden, Germany. The most confirmed kills by an Allied airman during WWI, Frenchman René Fonck, was five behind the Red Baron at 75. Next up was Canada’s Billy Bishop with 72 and Mick Mannock with 61. Reading about his penchant for making souvenirs out of enemy items makes me shudder.